There are new things popping up every day at the Walt Disney World Resort and the Universal Orlando Resort. Join us every week to ready about “What’s New”! This week features “Star Wars” Weekends, Disney character meet and greet changes, and incredible news, photos and videos from Wizarding World of Harry Potter Diagon Alley. New! 2014 “Star Wars” Weekends Begina May 16: “Star Wars” Weekends has finally arrived! Starting Friday, May 16 and continuing for the next four weekends, Disney’s Hollywood Studios Guests can see celebrities from the films and television series and enjoy special shows and panels at various locations in the park. Returning this year are the shows: Behind the force: “Star Wars Rebels”. Stars of the Saga and Obi-Wan and Beyond starring James Arnold Taylor.Also returning this year are “Legends of the Force” Motorcade and Celebrity Welcome, Padawan Mind Challenge and DJ Lobot Dance Party. New this year will be nightly “Symphony in the Sky” fireworks and the dining and experience options we mentioned previously.The celebrity host this year is James Arnold Taylor along with co-host Ashley Eckstein. The celebrity guests for weekend are James Arnold Taylor, Ashley Echstein, Ahmed Best (Jar Jar Binks), Peter Mayhew (Chewbacca), and Vanessa Marshall(Voice behind Hera Syndula -Star Wars Rebels). New! “Star Wars” Cupcakes Available at Disney’s Hollywood Studios: Beginning Friday, May 16, a Darth Vader cupcake and a Yoda cupcake will be available for guests to purchase during “Star Wars” weekends at select locations around Hollywood Studios. 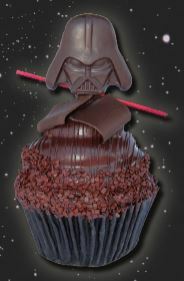 If you are a chocolate lover, a peanut butter lover, or both, you will definitely be tempted to join the dark side with our Darth Vader cupcake. This treat will be arriving at Disney’s Hollywod Studions for $5.19 at select quick service locations: FairFax Fare, Pizza Planet, Starring Rolls, Backlot Express, ABC Commissary, Studio Catering Co., Rosie’s All American Cafe’, and Darth’s Mall. 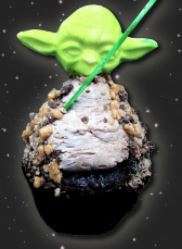 The amazing-looking Yoda cupcake will also be available for “Star Wars” weekends and will be sold at Backlot Express, Starring Rolls Cafe’ and Darth’s Mall only. Both are part of the Disney Dining Plan and will be available May 16 – June 15. New! 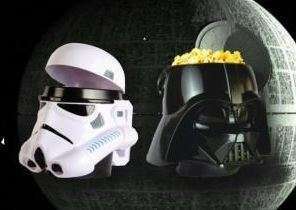 Darth Vader popcorn Buckets and Stormtrooper Drink Mugs: New food merchandise will be available at Star Wars Weekends this year. The Darth Vader popcorn bucket will be available to be filled with regular or caramel popcorn at Hollywood Studios popcorn carts and Darth’s Mall. The Stormtrooper fountain drink mug will be available at most quick service restaurants at Hollywood Studios. NEW! Tinker Bell moving to Town Square Theater: Beginning May 20, Tinker Bell will be moving from Adventureland to Main Street, USA, where guests will discover a portal to Tinker Bell’s Magical Nook inside Town Square Theater. As guests enter the new Garden Theater at Town Square Theater, they will magically shrink down to the size of a fairy and step inside Tinks Magical Nook, where they’ll join Tink in a beautiful, natural setting filled with a collection of her treasures from the mainland. Disney FastPass+ service will be available for this experience at Town Square theater, as well as for the opportunity to meet Mickey Mouse. New! Daisy and Donald Duck have a new greeting location in Animal Kingdom: Beginning, Sunday, May 11, Daisy and Donald will begin greeting guests at Character Landing in Discovery Island. This will not be a FastPass+ option for guests at this time. To accommodate for Daily and Donald, Winnie the Pooh and Tigger will no longer be appearing at Disney’s Animal Kingdom adter Saturday, May 10th. Guests may continue to meet Winnie the Pooh and Tigger in Fantasyland at Magic Kingdom. New! Disney Cruise Motorcoaches get a new design: Guests will start to see new Disney Cruise Line motorcoaches when traveling from Orlando International Airport or from Walt Disney World Resort hotels to Port Canaveral for Disney cruises. The new design includes beloved Disney characters such as Mickey, Donald Duck and his nephews Huey, Dewey and Louie. The motorcoaches include new and improved safety features including a new curved entrance onto the motorcoach with an additional step for a more natural, safer walk onboard as well as an improved wheelchair lift. In addition, sear belts are now available as an option for guests. Reminder! “Rock your Disney Side: 24-hours” coming May 23-24: Magic Kingdom will open for 24 hours nonstop between May 23 and 24, as Disney Parks jumpstarts summer with a one-of-a-kind event, “Rock Your Disney Side: 24 Hours.” The event includes special “heroes and villians” themed entertainment and offerings, and guests are invited to dress as their favorite characters. Destinations in Florida is hosting the “World’s Largest Disney Meetup” during the event. Join in on the fun on Facebook. Reminder: Epcot International Flower & Garden Festival Continues: This fantastic and colorful festival continues. Here are some of the highlights this week: Flower Power Concert Series performances by Alan Parsons Live Project, May 16­18 at 5:30, 6:45 and 8 pm.; Designers’ Stage ­ weekdays, noon and 3 pm will host Victoria Boudman, Square Foot Gardening for Kids ­May 13­-15; and Designers’ Stage ­ Presented by HGTV Friday­-Sunday, noon and 3 pm will host Alison Victoria, Kitchen Crashers ­May 16­-18. Numerous additional presentations take place daily through the day during the entire festival which runs through May 18. New! Downtown Disney Conversion to Disney Springs Update: Disney Springs project construction continues rapidly in the Downtown Disney area. One noticeable change that recently took place was the removal of the Marketplace Archway. A new wall configuration is in place at the Lilly Pad near Fulton’s Crab House and Portobello to prepare for The Landing construction. The Portobello front patio won’t be accessible starting this week, as part of this project. This work is expected to be complete this summer. Also, Buena Vista Drive roadwork is underway and bus loop changes are noted below. Significant enhancements to the roadway include widening it to 10 lanes, adding a dedicated bus lane and building two convenient pedestrian bridges that will allow Guests to safely cross over Buena Vista Drive to Downtown Disney. Watercraft routes have temporarily changed and the Saratoga Bridge construction continues. ▪ Pleasure Island Bus Stop: 8a.m. ­ 2 a.m. Reminder! Free Dining Offer is Back for Fall / Winter: Are you considering a trip to Walt Disney World Resort this fall or winter? If so, there is a great new offer you might like. You can get a free Disney Dining Plan when you purchase a non­discounted room and ticket package at select Disney Moderate, Disney Deluxe or Disney Deluxe Villa Resort hotels. Or, you can get a FREE Quick­Service Dining Plan when you purchase a non­discounted room and ticket package at select Disney Value Resort hotels. Offer valid for arrivals most nights Aug. 31­Oct. 3, Oct. 26­Nov. 1, Nov. 9­20, Dec. 12­23, 2014. Book by Aug. 8, 2014. Destinations in Florida is throwing in free Concierge Services and a free call from Mickey Mouse! Plus, there is a room­ only discount available for travel between Aug 16 and Oct 3 too. Call 877-­918­-8941 or Request a Price Online. ▪ Now – May 18: Representatives from Rinse Bath and Body Co. will be on hand throughout the day to help you select the product that is right for your skin at the Epcot International Flower and Garden Festival. ▪ May 10 – 20: Artist David E. Doss will be appearing daily at Art of Disney in Downtown Disney Marketplace. Stop in and find a new piece of art to add to your collection! ▪ May 17 – 18: Dana and Melanie Harvey from HARVEYS seatbeltbags are headed to Walt Disney World Resort! Don’t miss out on the opportunity to pick up some of the newest silhouettes inspired by their Pop Art Mickey collection and meet Dana and Melanie, May 17 from 11 a.m. – 2 p.m. at Tren­D in the Downtown Disney Marketplace; May 18 from 12:00 to 2 p.m. at Uptown Jewelers in Magic Kingdom Park; and May 18 from 5 ­7 p.m. at Summer Lace at Disney’s Grand Floridian Resort & Spa. New! Videos from Diagon Alley and Hogwarts Express Released: Universal Orlando released three videos this week. 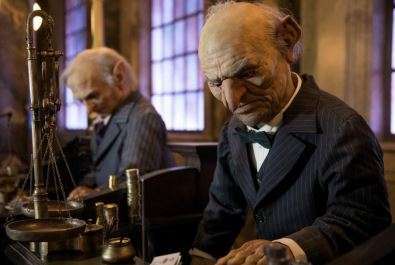 One is a short teaser showing the goblins from Gringotts bank (view it here), the second is a behind the scenes look at Hogwarts Express (view it here) and the final is a behind the scenes look at Harry Potter and the Escape from Gringotts (view it here). New! 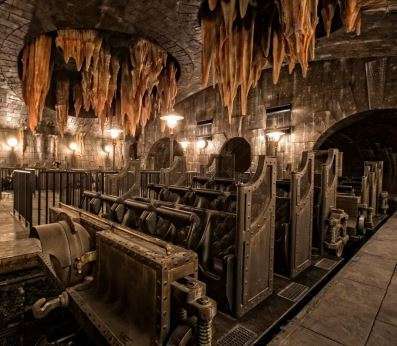 Photos and Screen Grabs from Harry Potter and the Escape From Gringotts Released: Universal Orlando released details of Harry Potter and The Escape from Gringotts Ride this week! Bellatrix Lestrange, Lord Voldemort, Gringotts Goblins, a 60­foot, fire­breathing Ukrainian Ironbelly dragon and the famous trio of Harry, Ron, and Hermione will all make appearances in the attraction! More details and photos can be found here. 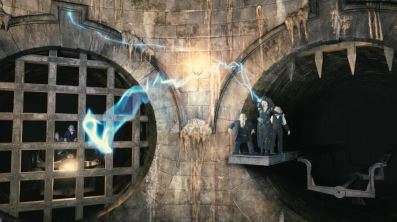 The multi­dimensional, multi­sensory attraction, Harry Potter and the Escape from Gringotts. Height Restriction 42 inches. Reminder! TODAY Show to Host Diagon Alley Sweepstakes: The TODAY Show is hosting “Discover Diagon Alley on TODAY” sweepstakes. The contest is to give away a three ­night trip to be part of the grand opening celebration to 25 lucky winners. The sweepstakes began Tuesday, May 13. To view the official website and read the rules, click here. Reminder! The Roots Set to Perform This Saturday at Universal Orlando’s Mardi Gras Celebration: The excitement of Mardi Gras continues this Saturday, April 19 with a performance by The Roots! The house band for Late Night with Jimmy Fallon, known for hosting sold­out jam sessions across country, and consistently churning out Grammy®­nominated albums will take the stage at Universal Orlando’s Mardi Gras celebration. Concert begins at 9 pm. Along with the live concert, guests can experience the spirit of the legendary Bayou bash during the dazzling Mardi Gras parade, featuring 12 vibrant floats, including three new additions celebrating Jules Verne’s novel, “Around the World in 80 Days.” Guests can also visit Universal Studios Florida’s very own French Quarter Courtyard to enjoy delectable Cajun cuisine and see performances by bands pulled straight from Bourbon Street. Reminder! Blueman Group Changes Prices and Ticket Types: Blue Man Group at Universal CityWalk now has new ticket types, including “Show only,” “Meal and Show” deals, Poncho, and Premium seating. In the new pricing structure, tickets start as low as $60 (with the exception of a $49 rate for Florida residents). The price does vary based on the season, show time and seat type. The “Meal and Show” option gives you an entree (from a specific list) and a coffee, tea or soft drink from one of 6 CityWalk restaurants. Previous Post Ups and Downs of a 24 hour Disney Day!